WASHINGTON D.C.—The longest federal shutdown in United States history has ended. Temporarily at least. 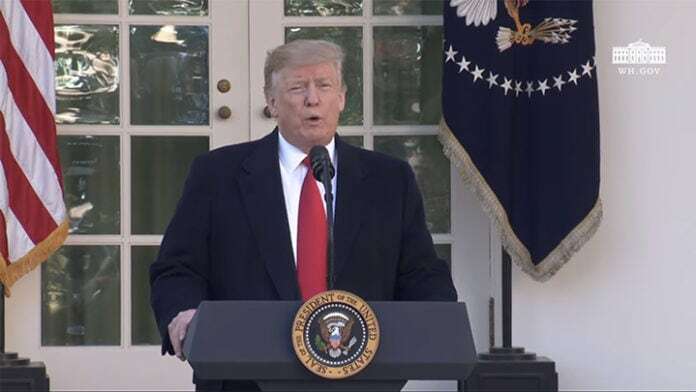 Friday afternoon President Donald Trump stood in the Rose Garden and announced that a congressional deal had been made late Thursday to temporarily reopen the federal government until February 15. By presstime the House of Representatives passed a bill agreed upon by both parties and sent it to the president’s desk. The proposal, as outlined by Trump in his speech, includes a bipartisan panel that will come up with solutions for border security. So far there has not been a mention whether the deal included any money nor did it specifically say a border wall. Overall the deal would be a continuing resolution for three weeks, which would include the current level of fencing and wall repair money, which levels out to be $1.3 billion for the year. “Our [Democrats] unity is our strength and I think maybe that is what the President underestimated,” said Speaker of the House Nancy Pelosi during a press conference immediately following the President’s Rose Garden announcement. If they don’t reach a deal, Trump is expected to say he’ll invoke a national emergency. Dallas Congresswoman Eddie Bernice Johnson says that she is glad the shutdown is over. However, her views on the border wall have not changed. Early Thursday the Senate attempted to push through two partisan bills aimed at reopening the government. Neither was expected to succeed. The Republican bill would have reopened government and funded President Donald Trump’s border wall. It received 50 votes.